Yet another unique Catalonian event which makes great family fun is, Three Kings Day. This is even more important than Christmas, atleast to children who are anticipating presents! 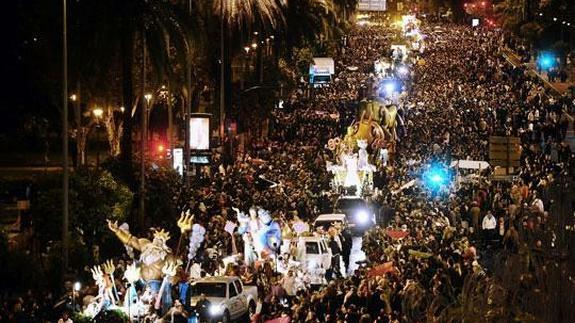 The “Cavalcada de Reis” takes place on January 5th. It is based on the account of the three Kings: Melchior, Caspar and Balthasar who followed a bright star all the way to Bethlehem to attend the birth of Christ. 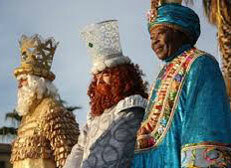 Riding a camel, an elephant and a horse the Kings arrived bearing gifts from faraway lands. 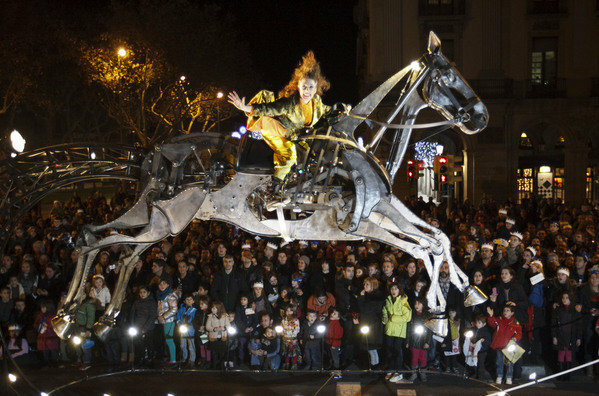 In Barcelona this event is re-created as the Three Kings Parade, where the Kings arrive by boat, actually a galleon, in Port Vell! Once they have been officially welcomed by the Mayor, they receive the Keys to the City for just one night. The Three Kings then proceed to make speech directed at children about the important of being good, and finally they parade through the streets of Barcelona accompanied by live music on grand colorful floats. On their visit the Kings will collect the letters (wish lists) of children too. In homes throughout Catalan that evening, children will leave their shoes outside in hopes of a visit from the Three Kings, bearing gifts for them. On Epiphany Day, you will want to try Roscon de Reyes. This is a cake filled with cream as well as a dried bean and a small figurine of king. Can you guess which one you want to find on your fork? If you said the King you are correct! The tradition goes that the one to receive the dried bean has to pay for the dessert, of course some people make up their own idea’s about what the loser does! You can find this cake in many bakeries in town. Catalonians love the Christmas season and you will too, when you spend a Christmas here. Bon Nadal! and Merry Christmas!